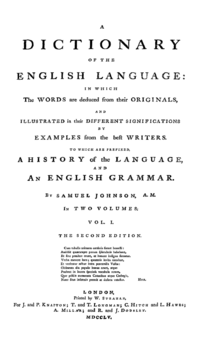 Published on 4 April 1755  and written by Samuel Johnson, A Dictionary of the English Language, sometimes published as Johnson's Dictionary, is among the most influential dictionaries in the history of the English language. English is a West Germanic language that was first spoken in early medieval England and eventually became a global lingua franca. Named after the Angles, one of the Germanic tribes that migrated to the area of Great Britain that would later take their name, England, both names ultimately deriving from the Anglia peninsula in the Baltic Sea. It is closely related to Frisian and Low Saxon, and its vocabulary has been significantly influenced by other Germanic languages, particularly Norse, and to a greater extent Latin and French. There was dissatisfaction with the dictionaries of the period, so in June 1746 a group of London booksellers contracted Johnson to write a dictionary for the sum of 1,500 guineas (£1,575), equivalent to about £220,000 in 2018. Johnson took seven years to complete the work, although he had claimed he could finish it in three. He did so single-handedly, with only clerical assistance to copy the illustrative quotations that he had marked in books. Johnson produced several revised editions during his life. Walter Jackson Bate was an American literary critic and biographer. He is known for Pulitzer Prize for Biography or Autobiography-winning biographies of Samuel Johnson (1978) and John Keats (1964). Samuel Johnson also won the 1978 U.S. National Book Award in Biography. Robert Dodsley was an English bookseller, poet, playwright, and miscellaneous writer. Sir Thomas Elyot was an English diplomat and scholar. Richard Mulcaster is known best for his headmasterships of Merchant Taylors' School and St Paul's School, and for his pedagogic writings. He is often regarded as the founder of English language lexicography. In 1598 an Italian–English dictionary by John Florio was published. It was the first English dictionary to use quotations ("illustrations") to give meaning to the word; in none of these dictionaries so far were there any actual definitions of words. This was to change, to a small extent, in schoolmaster Robert Cawdrey's Table Alphabeticall , published in 1604. Though it contained only 2,449 words, and no word beginning with the letters W, X, or Y, this was the first monolingual English dictionary. The problem with these dictionaries was that they tended to be little more than poorly organised and poorly researched glossaries of "hard words": words that were technical, foreign, obscure or antiquated. But perhaps the greatest single fault of these early lexicographers was, as historian Henry Hitchings put it, that they "failed to give sufficient sense of [the English] language as it appeared in use." In that sense Dr. Johnson's dictionary was the first to comprehensively document the English lexicon. A Dictionary of the English Language was somewhat large and very expensive. Its pages were 18 inches (46 cm) tall and nearly 20 inches (51 cm) wide. The paper was of the finest quality available, the cost of which ran to nearly £1,600; more than Johnson had been paid to write the book. Johnson himself pronounced the book "Vasta mole superbus" ("Proud in its great bulk"). No bookseller could possibly hope to print this book without help; outside a few special editions of the Bible no book of this heft and size had even been set to type. Boswell  relates that "A lady once asked him [Johnson] how he came to define pastern as the knee of a horse: instead of making an elaborate reply, as she expected, he at once replied, 'Ignorance, Madam, pure ignorance.'" On the same page, Boswell notes that Johnson's definition of network ("Any thing reticulated or decussated, at equal distances, with interstices between the intersections")  "has often been quoted with sportive malignity, as obscuring a thing in itself very plain." Johnson's Dictionary has been available in replica editions for some years. The entire first Folio edition is available on A Dictionary of the English Language  as an electronic scan. 1 2 UK Retail Price Index inflation figures are based on data from Clark, Gregory (2017). "The Annual RPI and Average Earnings for Britain, 1209 to Present (New Series)". MeasuringWorth. Retrieved 6 November 2017. ↑ Bate, Walter Jackson. Samuel Johnson, Ch. 15, "Storming the Main Gate: The Dictionary". New York: Harcourt Brace Jovanovich, 1975. ↑ Boswell, James (1791). "The Life of Samuel Johnson, Volume 1". Sturgis & Walton. Retrieved 9 July 2017. ↑ Johnson, Samuel (1755). "Network - A Dictionary of the English Language". "Johnson's Dictionary Online". Retrieved 9 July 2017. ↑ A DICTIONARY, Spanish and English, and English and Spanish, . .
↑ Crystal, David (2005). Samuel Johnson A Dictionary of the English Language: An Anthology. London: Penguin Books. p. xxviii. ISBN 978-0-14-144157-3. ↑ Johnson, Samuel (1807). Dictionary of the English Language Abstracted from the Folio Edition (12th ed.). London: J. Johnson et al. p. Title Page. ↑ Lynch, Jack (2004). Samuel Johnson's Dictionary. London: Atlantic Books. p. 17. ISBN 1-84354-296-X. ↑ "A Dictionary of the English Language: A Digital Edition of the 1755 Classic by Samuel Johnson" . Retrieved 21 November 2013. ↑ "The Preface on Project Gutenberg". Gutenberg.org. 1 April 2004. Retrieved 15 April 2009. ↑ "Volume 1 of the 6th edition". Archive.org. Retrieved 21 January 2010. ↑ "Volume 2 of the 6th edition". Archive.org. Retrieved 21 January 2010. Lexicology is the part of linguistics that studies words. This may include their nature and function as symbols, their meaning, the relationship of their meaning to epistemology in general, and the rules of their composition from smaller elements . Lexicology also involves relations between words, which may involve semantics, derivation, use and sociolinguistic distinctions, and any other issues involved in analyzing the whole lexicon of a language. Nathan Bailey, was an English philologist and lexicographer. He was the author of several dictionaries, including his Universal Etymological Dictionary, which appeared in some 30 editions between 1721 and 1802. Bailey's Dictionarium Britannicum was the primary resource mined by Samuel Johnson for his Dictionary of the English Language (1755). Webster's Dictionary is any of the dictionaries edited by Noah Webster in the early nineteenth century, and numerous related or unrelated dictionaries that have adopted the Webster's name. 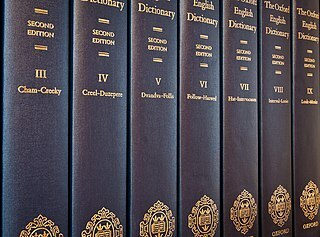 "Webster's" has become a genericized trademark in the U.S. for dictionaries of the English language, and is widely used in English dictionary titles. 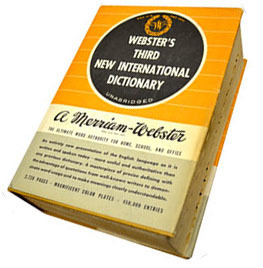 Merriam-Webster is the corporate heir to Noah Webster's original works, which are in the public domain. Honorificabilitudinitatibus is the dative and ablative plural of the medieval Latin word honōrificābilitūdinitās, which can be translated as "the state of being able to achieve honours". It is mentioned by the character Costard in Act V, Scene I of William Shakespeare's Love's Labour's Lost. A lexicographic error is an inaccurate entry in a dictionary. Such problems, because they undercut the intention of providing authoritative guidance to readers and writers, attract special attention. Henry Hitchings is an author, reviewer and critic, specializing in narrative non-fiction, with a particular emphasis on language and cultural history. The second of his books, The Secret Life of Words: How English Became English, won the 2008 John Llewellyn Rhys Prize. He is the president of the Johnson Society of Lichfield. As of 2018, he is chair of the drama section of the UK's Critics' Circle. The New World of English Words, or, a General Dictionary is a dictionary compiled by Edward Phillips and first published in London in 1658. It was the first folio English dictionary. John Kersey the younger was an English philologist and lexicographer of the late seventeenth and early eighteenth centuries. He is notable for editing three dictionaries in his lifetime: A New English Dictionary (1702), a revised version of Edward Phillips' The New World of English Words (1706) and the Dictionarium Anglo-Britannicum (1708). Papias was a Latin lexicographer from Italy. Although he is often referred to as Papias the Lombard, little is known of his life, including whether he actually came from Lombardy. The Oxford History of English Lexicography considers him the first modern lexicographer for his monolingual dictionary (Latin-Latin), Elementarium Doctrinae Rudimentum, written over a period of ten years in the 1040s. The Elementarium has been called "the first fully recognizable dictionary" and is a landmark in the development of dictionaries as distinct from mere collections of glosses. Papias arranges entries alphabetically based on the first three letters of the word, and is the first lexicographer to name the authors or texts he uses as sources. Although most entries are not etymological, Papias laid the groundwork for derivational lexicography, which became firmly established only a century later. A Dictionary of Slang and Unconventional English is a dictionary of slang originally compiled by the noted lexicographer of the English language, Eric Partridge. The first edition was published in 1937 and seven editions were eventually published by Partridge. An eighth edition was published in 1984, after Partridge's death, by editor Paul Beale; in 1990 Beale published an abridged version, Partridge's Concise Dictionary of Slang and Unconventional English.